Amazing photographs of amazing buildings taken with an amazing camera by the amazing thepete! SEE: The Chrysler Building closer than you have before! SEE: Historical New York City buildings from angles you don't normally see them! 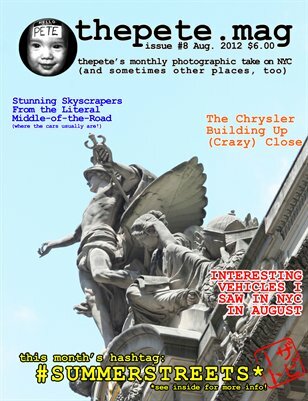 SEE: other cool stuff that thepete took photographs of during the month of August, 2012!! Don't want to spend $6.00 on the print version? Buy the e-version for just a buck!! Even our intrepid photographer can afford that! !